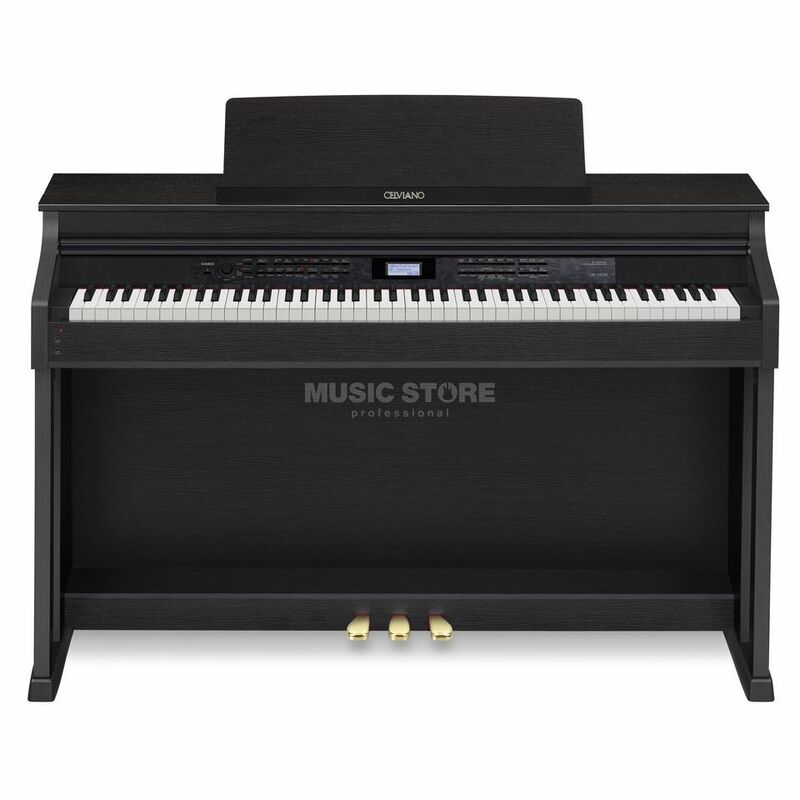 The Casio Celviano AP-650BK, Black is the finest model in the Celviano digital piano range. The Celviano AP-650 features Casio's multi-dimensional AiR (Acoustic & intelligent Resonator) sound source for an incredibly realistic and dynamic feel. There's a full scale keyboard with 88 keys, equipped with Tri-Sensor Scaled Hammer Action II technology to provide an authentic piano feel. This is enhanced by the simulated ebony and ivory feel of the keys, which have a minutely crimped surface to prevent finger slippage caused by sweat. The AP-650 features a staggering 250 professional quality instrument tones including stereo-sampled grand pianos, strings, brass, organs and bass, as well as 180 drum rhythms. The included Music Preset function provides chord progressions for one-touch access to 300 presets in a variety of different musical styles. An innovative feature is the Lid Simulator, which emulates the changes in volume and sound characteristics when a grand piano's lid is open or closed. The AP650 also features a Key Off simulator, changing the amount of reverberation based on the speed of the key release. A slow release provides longer reverberation, and a faster release providing a short reverberation. Authentic emulation of a grand piano continues with the inclusion of Damper Resonance, providing a beautiful resonance when using the damper pedal. This is possible because of a stereo resonance simulator installed on all keys. There are three sensitivity levels, as well as an option to turn this feature off. The AP-650 includes reverb, chorus and brilliance effects, as well as a metronome with a 20-255BPM range. The Celviano AP-650 includes a two-track recorder for recording and playing back performances. There are also functions for splitting and layering the piano keyboard, and a duet mode, which enables the piano to be split into two equal ranges and an octave shift mode. The AP-650 includes a black wooden stand with a folding and sliding cover and three built-in pedals.